Spring is here and I have a fun project which will not only get you organized, but it will add that little spring touch to your home décor! 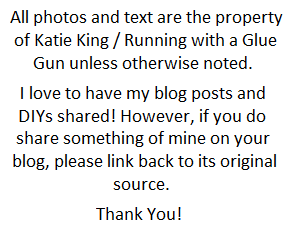 Also, in this project, I will be using items from Simple Stories! Now unless you being living under a sad little non-crafty rock, then you probably already know all about Simple Stories (lol). 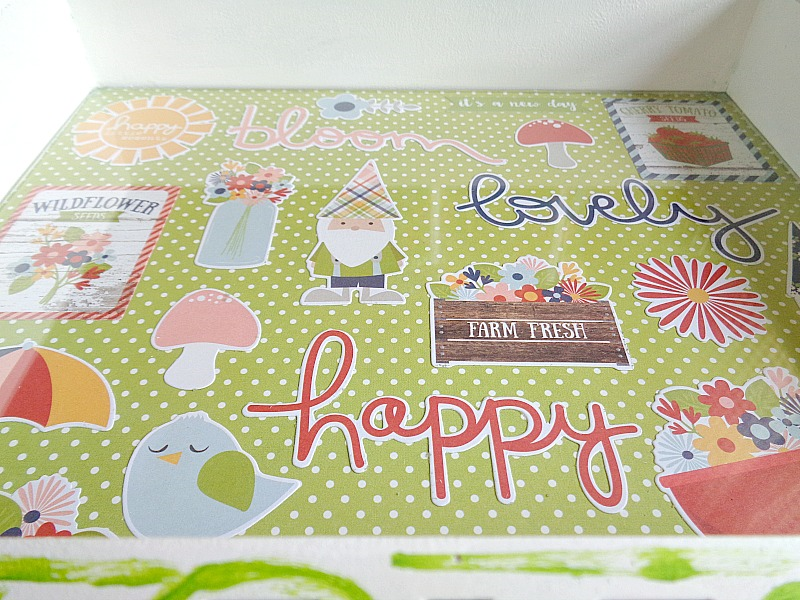 However, if you don't, Simple Stories is a company that makes adorable scrapbooking and planning type products. 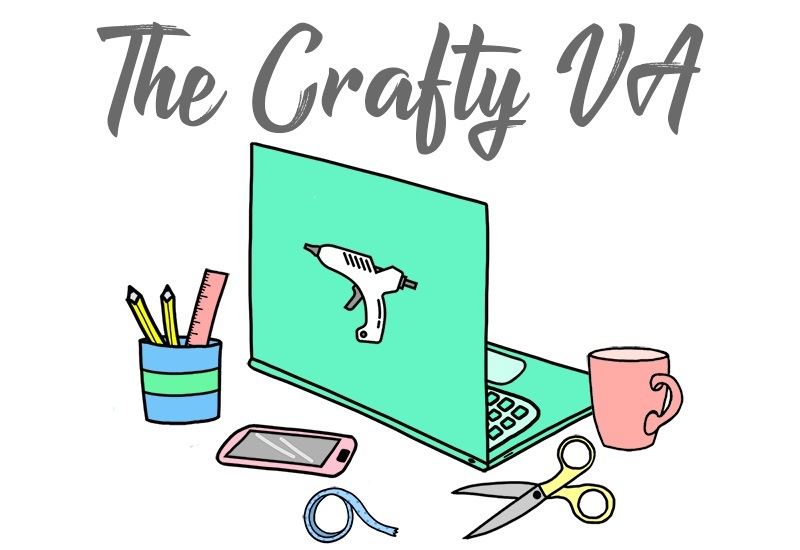 Specifically, they create paper, albums, tools and embellishments, which can all be used to take your scrapbooking or general crafting to the next level. Today I will be using some products from their newest collection call Bloom & Grow! The glass tray that I'm making today is super easy to put together and doesn't require you to actually have glass professional cut (will talk more about that later)! 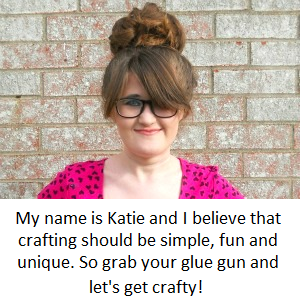 Also, this project can be totally customizable to fit your unique taste and design style! 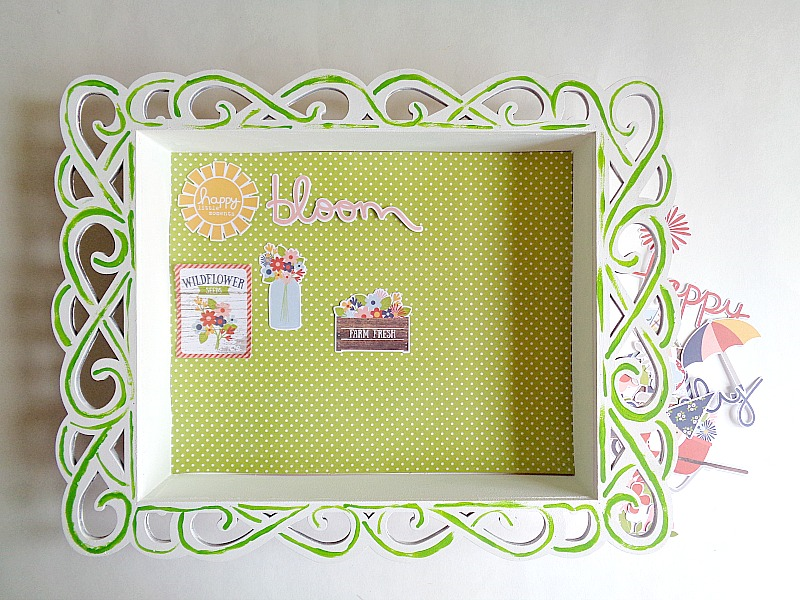 Crafty FIY: The glass I'm using in this project is from a picture frame! All I did was measure the bottom of my tray and noted that is was 8 by 10 inches. Then I found an old 8 by 10 inch picture frame and took out the glass. I then cleaned it up, placed it inside my tray and it fit perfectly! You may want to try this method before you think about getting a piece of glass professional cut. 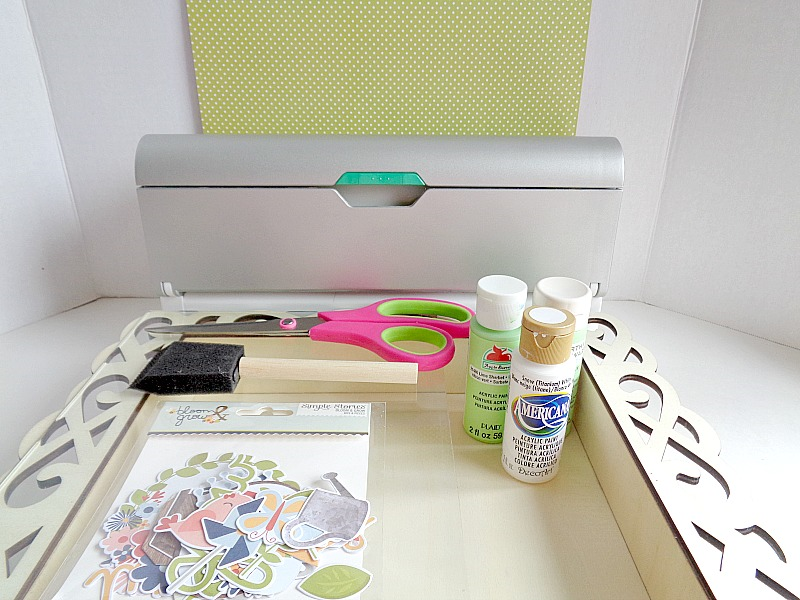 Step 1: Paint your tray inside and out. 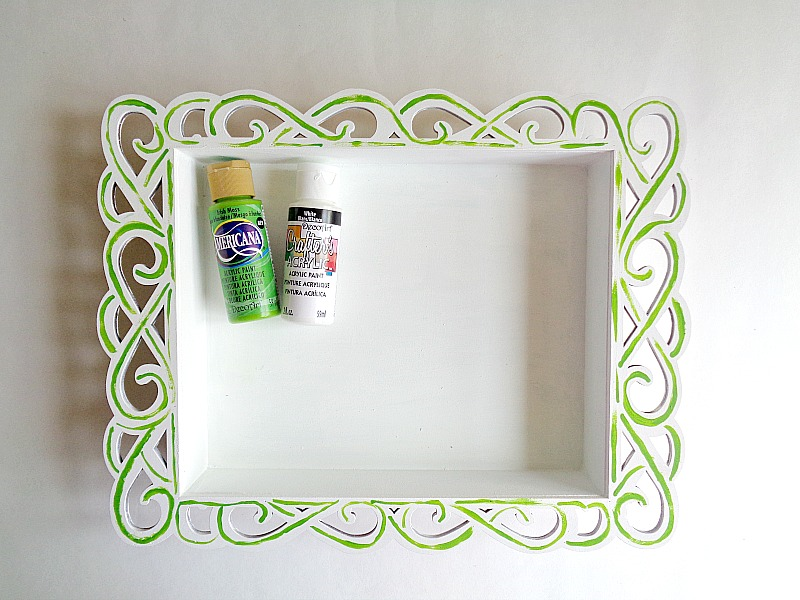 I decided to paint my tray white and added green accents to the edge of the tray. When your tray is completed painted, set it aside to dry. 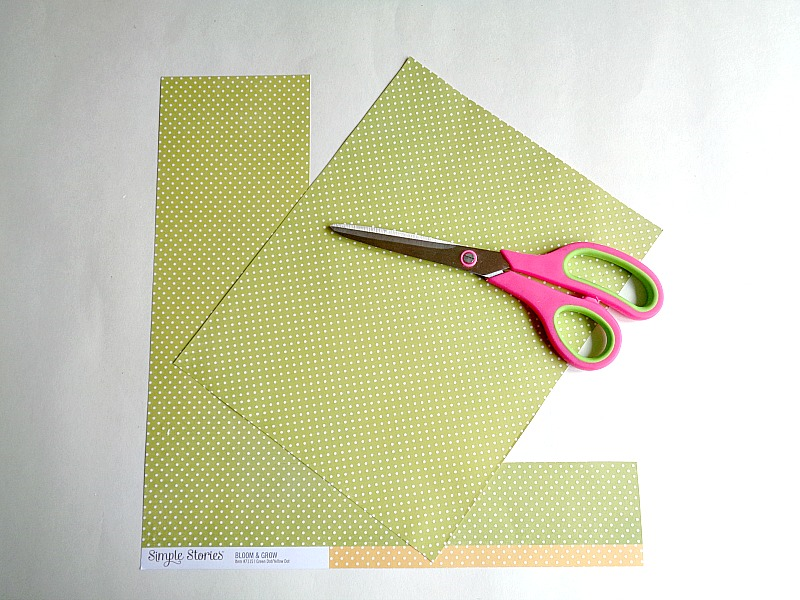 Step 2: Measure and cut out a piece of Simple Stories scrapbooking paper that will fit in the bottom of your tray. 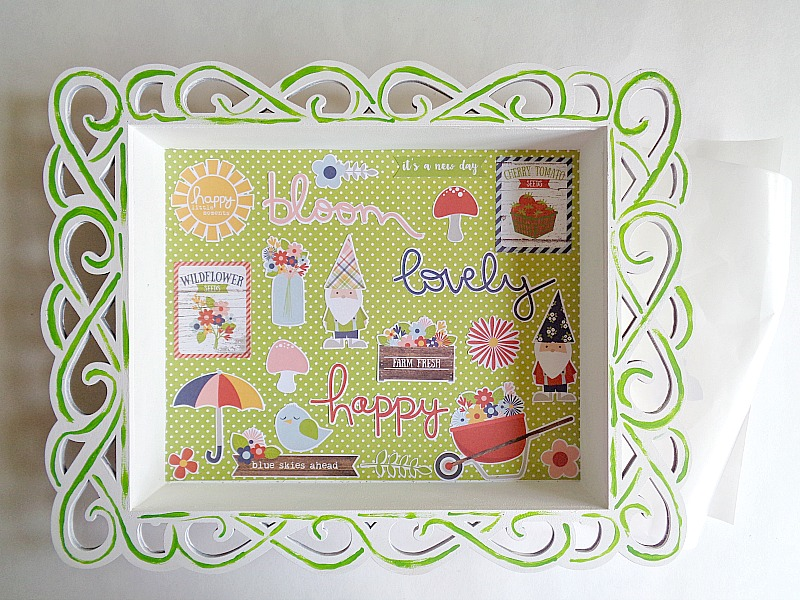 Step 3: Grab your piece of Simple Stories scrapbooking paper (from step 2) and place it in the bottom of your tray. Then grab your Simple Stories cardstock die-cuts and begin playing around with the layout. Once you have a layout that you're happy with, take a picture with your phone, so you can remember where all the pieces go. Finally, remove all your pieces from your tray. 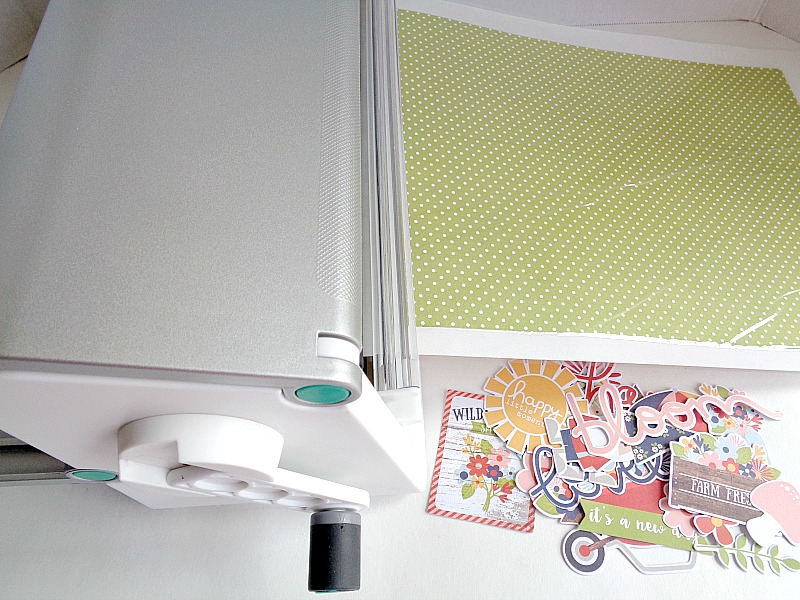 Step 4: Grab all of your paper pieces and run them through your Xyron® 9'' Creative Station. Step 5: Now take each piece and rub the top of the sticker paper. Then peel each paper piece off the sticker paper and adhere them to the inside of your tray. You will first want to adhere your large piece of scrapbooking paper then add all of your small cardstock die-cut pieces. Step 6: Grab your favorite industrial strength adhesive and apply a small amount around the inside edge of your tray. Then take your piece of glass and set it inside the tray, pressing it into the glue. Once your glue as dried and your glass is in place, then you're done! 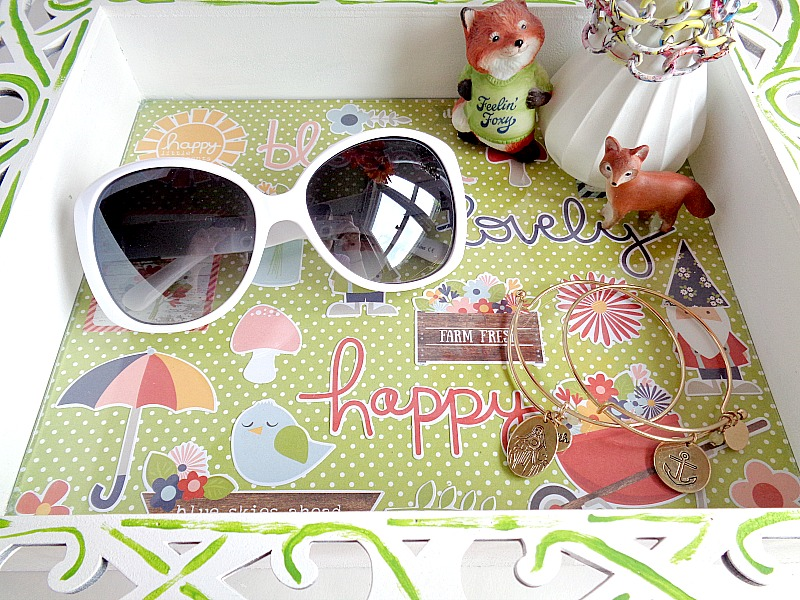 Doesn't this project scream spring? 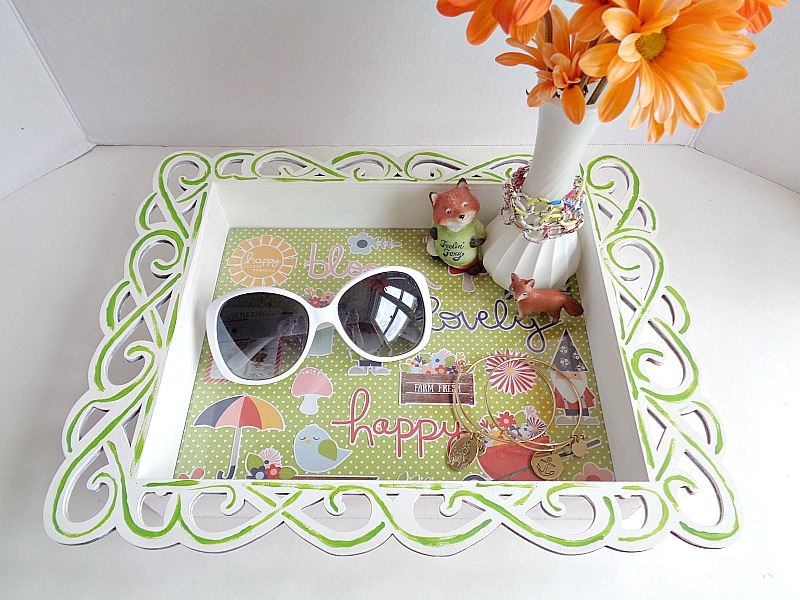 This tray would look really cute on top of a vanity, end table or on a table right by your front door. At the beginning of this post, I mentioned that this project could be customized to fit your unique taste and design style! This is totally true because (if you're a paper lover) this project is a great way to show off that new paper collection you have been drooling over. For example, I used Simple Stories's Bloom & Grow collection, however, I could have used their Sunshine & Happiness, Life in Color or any of their other paper collections. The point is, I know that a lot of you go out and buy a paper collection in its entire. This is a great project to really use of all of those different pieces and really gets your money's worth out of that paper collection. So what do you think? 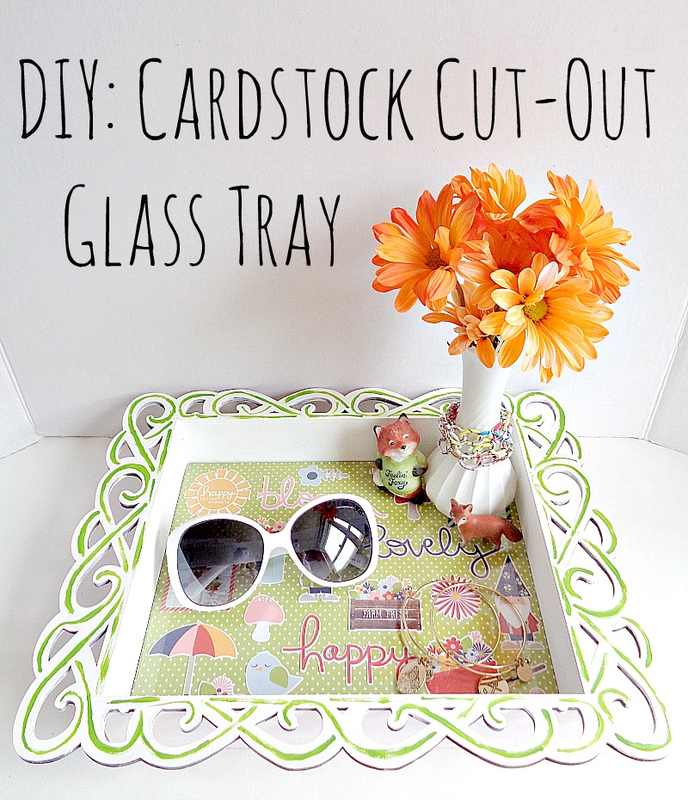 Do you like this cardstock cut-out glass tray?